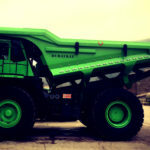 A Liebherr T 284 ultra-class mining truck. 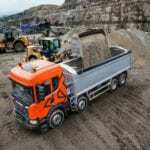 Liebherr has increased the payload capacity of its T 264 ultra-class mining trucks to 240 tonnes following the implementation of several upgrades. The changes include a front wheel design and braking system that improve torque and operational safety, particularly during downhill operations. Upgraded wheel motors and rear gear ratio can ensure similar cycle times while boosting payloads by 10 per cent. Liebherr stated the T 264 would be best matched with the company’s four-pass R 996 B and three-pass R 9800 mining excavators. Additionally, its T 282 C and older T 284 models can be retrofitted to increase payloads and capacity up to a total of 375 tonnes. Engine power ratings for the T 264 are also available up to 2013 kilowatts, supporting increased payloads. Tier 4 engines, which can help reduce emissions when compared with alternative engine models, are available for the T 264 and T 284 models. 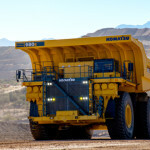 Liebherr’s online portal Liebherr Mining Data (LMD), which delivers real-time performance data related to the company’s mining trucks, is now standard with all new Liebherr ultra-class mining trucks, and can also be retrofitted for older T 282 C trucks.